Every financial year, taxpayers look for legal ways to protect their savings and minimise tax liability. The pressure to keep up with the costs of living, the skyrocketing property rates or the ever-increasing health care costs in India, fuels the need to save on tax even further. Besides methods such as house rent allowance, saving on home loans, Fixed Deposits and PPF accounts, investing in health insurance is a legitimate and rewarding method to save tax. It not only helps to manage medical care costs but it is also a great tax-saving instrument. Here’s why investing in a health insurance is best for your wealth. As per the Income Tax Act, an individual (resident, non-resident, Indian citizen, foreign citizen) can claim tax deductions under section 80D for medical insurance purchased for self, spouse, parents and dependent children. The same can be claimed by HUF (resident or non-resident Hindu Undivided Family) for insurance in the name of any family member. Medical insurance purchased and paid by employers, on behalf of their employees, will not be tax deductible under section 80D. If employees pay any part of the premium themselves and it is part of their CTC, then it is tax deductible. Health insurance cover for senior citizens can be a little expensive. This is largely because with old age, the risk of several ailments and contracting diseases is high. As per the risk assessment by companies, the higher the size of the risk, the higher the premium. With growing awareness about health and wellness, many people choose to undergo preventive health check-ups. The charges paid for such medical tests (up to Rs. 5000) can be claimed while filing returns. For example: If in FY2018-19, an individual paid Rs. 20,000 as insurance premium and paid Rs. 5000 for a health check-up (self, spouse, parents or children), then they can get a tax deduction of Rs. 25,000 as allowed under section 80D instead of only the premium amount. However, this Rs. 5000 is the total deduction allowed to a taxpayer and not for each family member of the taxpayer. In addition, tax deduction on preventive health check-up benefits can’t exceed the per annum limit (Rs. 25, 000/Rs. 30,000 till A.Y 2018-19 & 25,000/50,000 from A.Y 2019-20) as discussed above and is not available to a HUF. In case of single premium health insurance policies having cover of more than 1 year, the aforesaid deduction shall be allowed (from A.Y 2019-20) on proportionate basis for the number of years for which the health insurance cover is provided. Many companies offer life insurance riders on policies. Disability rider, terminal illness rider, accidental death rider and term rider are few of the many examples. Premium paid on medical insurance riders is also eligible for deduction. The primary purpose of any health insurance should be the benefits associated with it, which will help you and your family as and when the need arises. 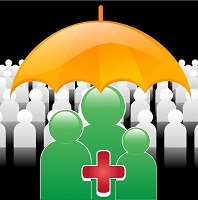 It is often advised to never base your decision solely on the tax benefits of a medical cover. Look for a medical insurance plan that not only protects you and your family’s health but also your hard-earned wealth.